This course presents the basics of programming in C# using the Visual Studio Express from Microsoft. You will learn how to download and install Visual Studio Express, a free software package, in a step-by-step manner. You will then be guided around the features and functions of the Visual Express Integrated Development Environment (IDE). The .NET Framework is the software framework developed by Microsoft that runs primarily on Microsoft Windows. You will be shown how C# can be used to create .NET applications. You will learn how to code in C# and how to use the IDE to review C# code for errors. You will learn about the Common Language Runtime (CLR) and how the CLR provides services such as memory management, security and exception handling. Finally, you will learn how to declare variables and assign values in C#, and how to create branches with the if .. else ... then decision statement and the conditional operator. 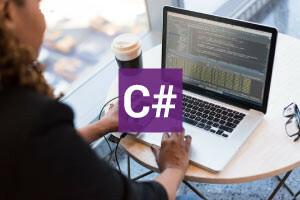 This course on C# Programming will be of interest to all learners who would like to learn more about C# programming and the Visual Studio Express for programming software applications.